Washington : A meeting Friday between President Donald Trump and newly powerful Democrats ended in varied descriptions of what transpired, with Republicans expressing fresh optimism a deal could be struck and their political opponents offering drearier views of a compromise. Neither side emerged detailing an immediate breakthrough that could end the continued stalemate that has allowed a partial government shutdown to wear on for two weeks. And despite his rosier outlook, Trump conceded the impasse could reach an historic length, a timeline first relayed by the Senate’s top Democrat. 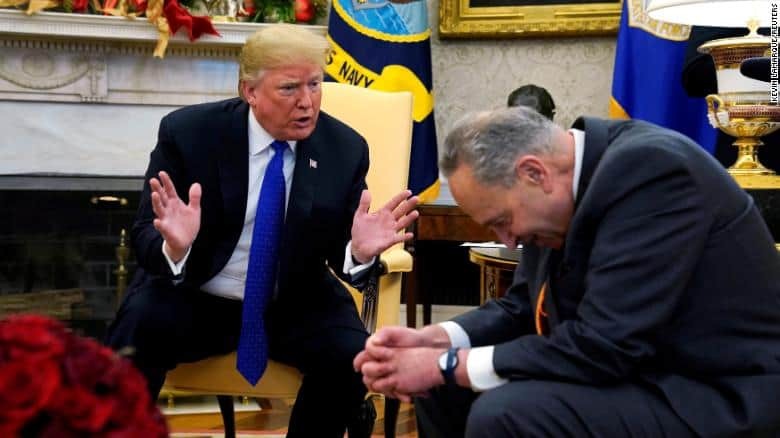 Later, two people familiar with the meeting said Trump even mentioned extending the standoff “to the election” and refused to back off his demand for $5.6 billion in funding for a border wall. He opened the talks by launching into a 15-minute salvo that also included griping at the House speaker for recent comments from Democratic lawmakers raising the specter of impeachment. Despite those disagreements, Trump announced that further discussions would occur over the weekend led by staff members. And he sought to highlight areas, like increasing port capacity, where he was in agreement with Democrats. It’s that question which still divides the White House and congressional Democrats, who have vowed to block any attempts to secure new funding for a border wall. Both sides remained firm in their positions on Friday following the two-hour meeting in the White House Situation Room. Democrats were equally dug in, saying the matter of a border barrier should only be brought up once the government has reopened. Trump offered little solace to federal workers affected by the shutdown in his remarks on Friday, a group he’s said little about since nine federal agencies saw their funding lapse last month. Some workers have said they are unsure of how they will pay for rent or living expenses without a regular paycheck. Asked if he thought landlords would be lenient on federal employees whose paychecks are affected by the shutdown, Trump said he did.